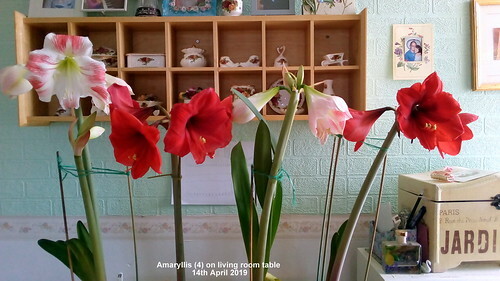 My Amaryllis have been flowering since the middle of March this year & I’ve had about 10 plants that have either finished flowering or are presently in flower on the living room table. I have another 4-5 at different stages in the growth of their scapes on the kitchen windowsill. These I think will be mainly red ones. But time will tell if they are plain red or White with red veining. I started the first plants off at the end of January, as soon as I noticed the first tip of a bud starting to poke its way out of the bulb. These bulbs had spent all winter, from about October/November, without a drop of water & without any heating (we very rarely put the heating on in our bedroom), all that time. I do nothing to start them off & they break dormancy of their own accord. That’s when I first start to give them a very little water. At this time the roots have dried up as well as the foliage & if they get too wet & cold for long they will rot. I only give them water when the scape is well under way & only start to water more frequently once the flowers have died & the leaves are growing. 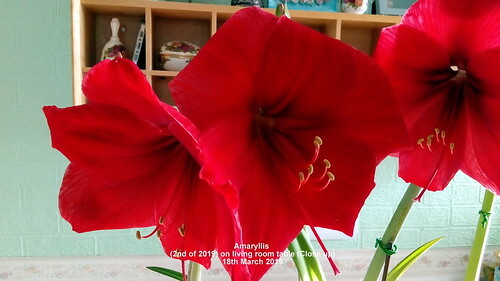 I will also start to water the first with fertilizer, (general purpose feed only till summer starts), as I will want to encourage the leaves to grow as it is these that will provide the bulbs with food to make new flower buds for next year. 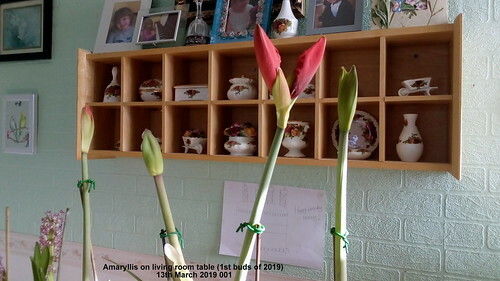 Just yesterday, (13th April), I gave another 10 pots of bulbs their first water in 6 months to make them break their dormancy period & start back into growth. Hopefully they will flower in 8-10 weeks time. Then I still have another 10-15 pots to start into growth before I’m finished waking them up for this year. I don’t expect to do this before the end of the month or even the beginning of May. 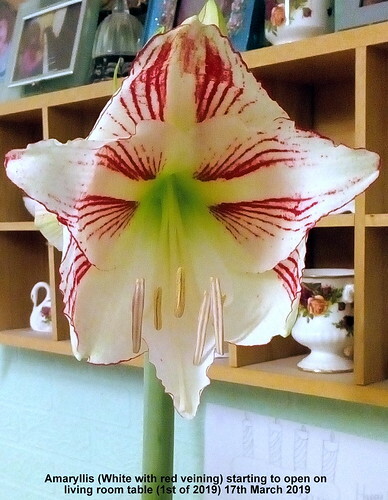 These last ones will not flower until the end of June & should continue to flower right through July. One of the advantages of having so many pots of bulbs is that I can control when they flower, each bulb will flower about 6-8 weeks after waking up from dormancy, so I can string them out over at least 6 months & never be without at least one plant in flower! 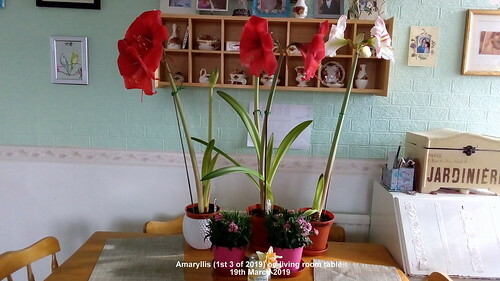 Thanks for this interesting post, Amarylis. Must go and look at mine. They are in a quiet corner of the garden and tend to be forgotten in their dormancy. This is the latest journal.